Know How To Make Bath Jelly. Make Your Shower Sessions Fun! Pour water into the saucepan and place it over medium-high heat. If you are using a microwave, you will need a microwave-safe bowl for heating water. Let the water come to a full, rolling boil. Remove the saucepan from the heat or the bowl from the microwave and transfer the boiling water to a mixing bowl very carefully. Start pouring unsweetened and unflavored gelatin powder into the boiling water a little at a time. Also, keep whisking the mixture with the hand whisk or stirring with the wooden spoon in order to ensure a smooth and uniform concoction. This step is vital and you need to be very cautious while carrying it out. Continue whisking until all gelatin powder is dissolved into the boiling water thoroughly. There should be no solid chunks or dry powder present in the mixture. However, make sure that you finish adding the gelatin powder completely to water before it cools down or reaches the room temperature. Otherwise, it will start forming lumps. Pour clear shower gel or body wash (shampoo or liquid hand soap can also be used if you wish) into this gelatin mixture. This is important to make your bath jelly actually work. You can go for both basic and aromatic products unless and until they are too harsh for your skin. The choice is yours. 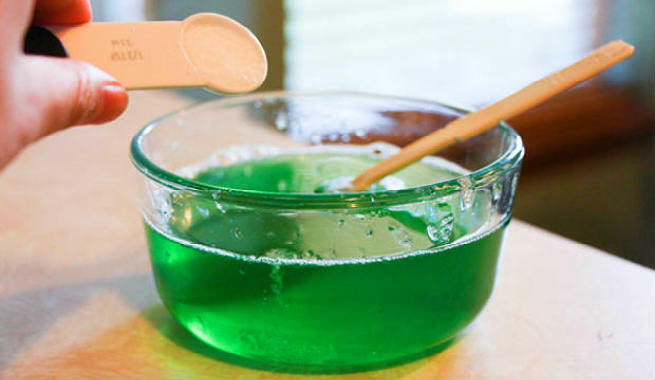 Mix the shower gel into the gelatin solution gently by using the wooden spoon. While the consistency of the solution will still remain runny enough, you have to ensure that the texture becomes totally smooth and silky. Pour jojoba oil or pure organic olive oil into this mixture. This will make your bath jelly extremely hydrating and keep your skin moisturized after use. You can also use any other super moisturizing and skin-friendly body oil or essential oil if you wish. At this step, add the scented fragrance oil to the concoction in order to give it a divine aroma. 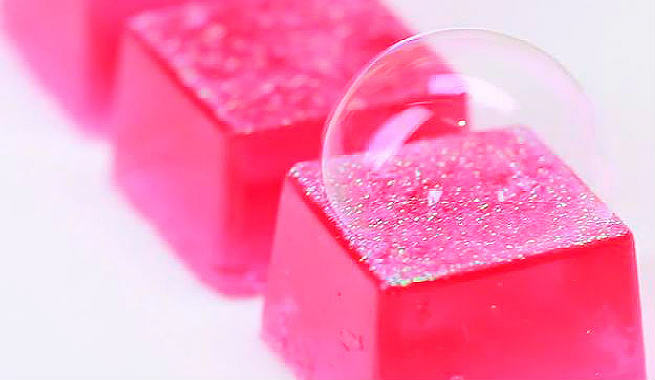 Now, give your bath jelly mixture a beautiful color by adding a few drops of food coloring to it. 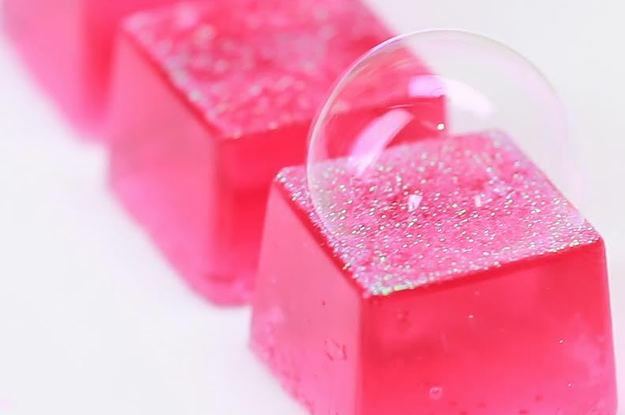 If you want your bath jelly to sparkle, sprinkle some glitter flecks (or eyeshadow pigment) of your choice into the silicon molds and distribute them evenly so that the entire inner sides of the molds are covered. Pour your liquid bath jelly concoction into silicon molds very slowly so that you do not end up generating too many air bubbles. Otherwise, your bath jellies will turn quite drying. You can also spritz some rubbing alcohol over the air bubbles in order to get rid of them. Place the molds in the refrigerator and let them sit for 4 to 5 hours. It will allow the jelly mixture to harden. Once everything is set well, take the molds out of the fridge and pop the jellies out of them. If you are using bowls or cups in place of molds, simply take the jellies out and cut them into small chunks. Voila! To make a vegan version of this bath jelly, replace gelatin with ‘agar-agar’. The ratio of gelatin to water should be 1:1. However, you can also follow the instruction given on the carton of gelatin. 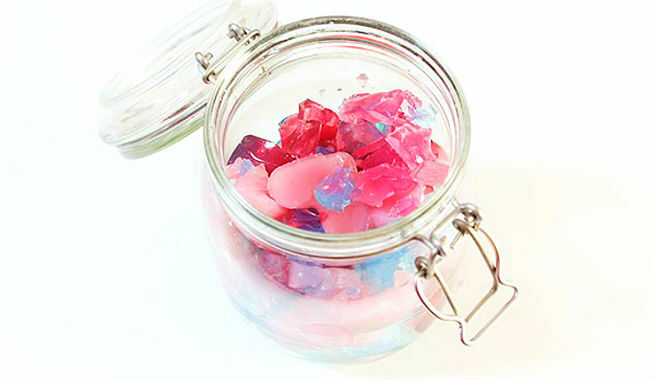 To avoid the presence of lumps or chunks in your homemade bath jellies, try to make the mixture as smooth as possible. For bath jellies of different colors, use more than one food coloring as well as separate mixing bowls and silicon molds. Make sure that the scented fragrance oil and the glitter or eyeshadow pigment are body-safe and of premium cosmetic grade. If you cannot avail silicon molds, simply take small glass jars and let your bath jellies stay inside them. Plastic ice trays or bowls or cups will also do. Now, it’s time to do some ‘jiggle-jiggle’ with your ‘babies’! What do you say?